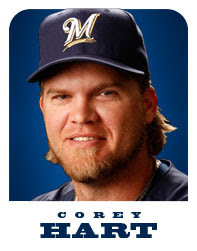 Corey Hart 1913 Bobblehead Revealed! 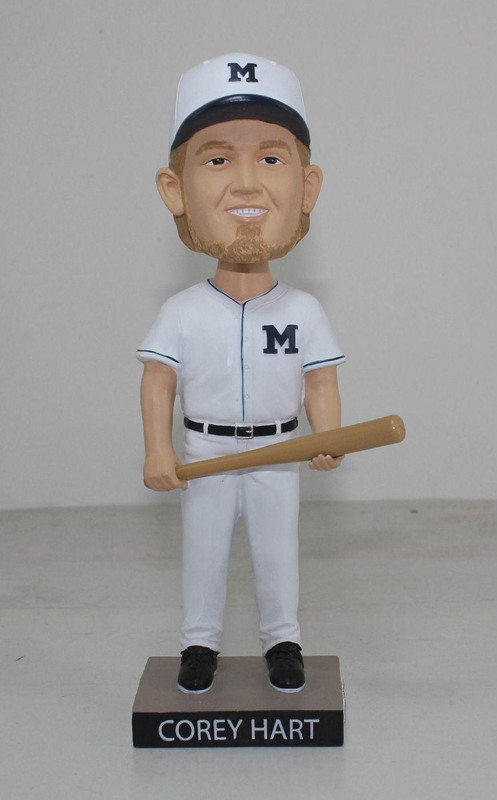 The Brewers have released the first photo of the fan giveaway Corey Hart bobblehead, wearing a retro 1913 uniform to celebrate the centennial of the Brews' first pennant. Looks sharp, although I'd prefer he show a little sock. 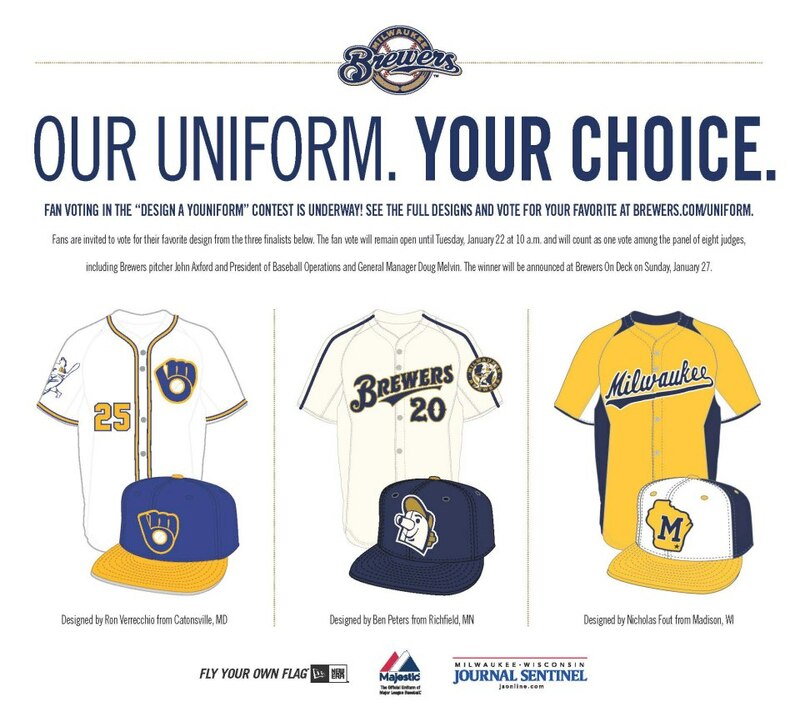 Still, it's an excellent recreation of the uniforms, and I'm glad to see the Brewers were able to make good use of the research material I sent them. Buy your tickets now for Sunday, May 5 to watch the Brewers take on the St. Louis Cardinals, and take home one of these beauties for yourself. 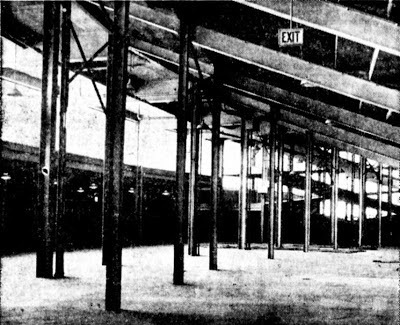 Sixty years ago today, the Milwaukee Sentinel ran this nearly-full-page photo essay of Milwaukee's new County Stadium, which was almost ready for the Brewers to move in. 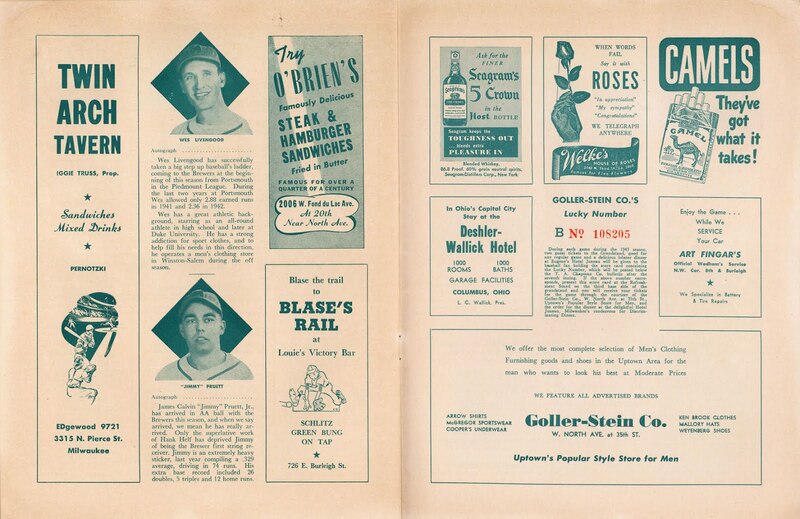 and this 1952 Spring Training roster card. 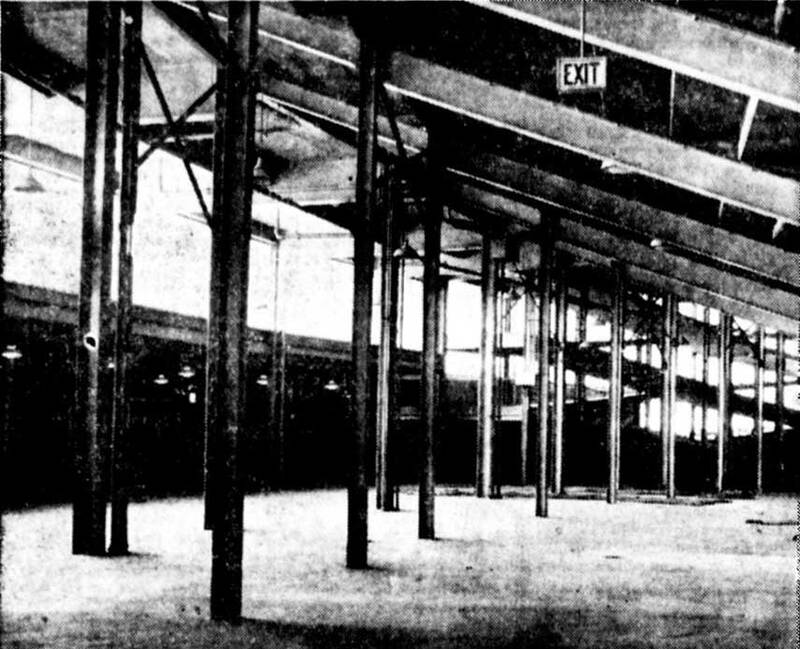 Within months, they would finally be out of their old wooden ballpark crammed into the city block at 8th and Chambers an in a modern, concrete-and-steel ballpark with acres of parking and room to stretch out. Let's look at each of the photos individually. Although winter is scheduled to be with us for another couple of months, the picture at the new Milwaukee County Stadium is encouraging enough to lead us to believe Jack Frost will get an early boot. This photo of the new stadium's grandstand shows the progress being made to have everything shipshape for the opening day's festivities April 15. The stadium will seat close to 30,000. There will be 16,865 lower grandstand seats, including 4,263 box seats, while the upper deck will handle 10,321 customers. Another 675 will be accommodated in the press box, while plans now call for about 2,000 bleacher seats. 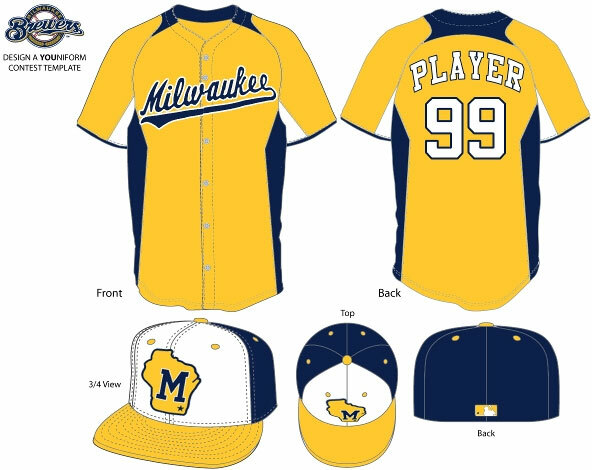 Yessir, Milwaukee's anxious to hear "Play Ball!" Outstanding. Of all the expansions to County Stadium over the years, the main stands were the least affected. Aside from the ends, which saw additions in the subsequent years, this photo could have been taken when I started going to games in the 1970s, or in the 1990s as the stadium saw its final years. Sentinel writer "Red Thisted (left), who has covered the Milwaukee Brewers for the last 27 years, tours the new baseball layout with Earl Levy, Brewers' ticket sales director. Note how well installation of lower grandstand seats is coming along. Baseball experts the country over are marveling at the new layout and labeled the park America's finest. "Red" is in the press section. It wasn't just "baseball experts" marveling over the new park; other teams were taking notice. In St. Louis, Browns president Bill Veeck was trying to move his club back to Milwaukee (where they had played through the American League's founding in 1901), and of course Boston Braves boss Lou Perini was preparing to take over his top farm club's new home for himself. 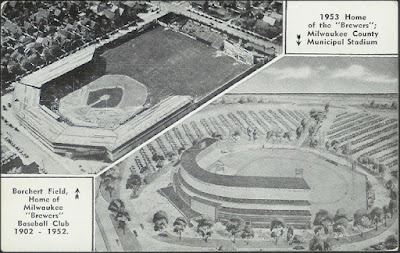 County Stadium was the culmination of plans, begun in the late 1930s, to lure a Major League club back to the Cream City. I doubt anyone involved suspected how successful those plans would eventually be. All this scene (under the new grandstand) needs to make it complete is a surge of baseball fans milling to get into the park to match the nation's favorite pastime. But it won't be long before King Baseball is back and Milwaukeeans will be flocking to heir new sports palace. I remember this concourse well, although in my mind I see it crammed with the food vendors and merchandise stands of the 1970s and 1980s. These turnstyles will be humming when those crowds start pouring into the stadium. For Brewer fans who remember the antiquated gate at Borchert Field this scene looks like paradise. 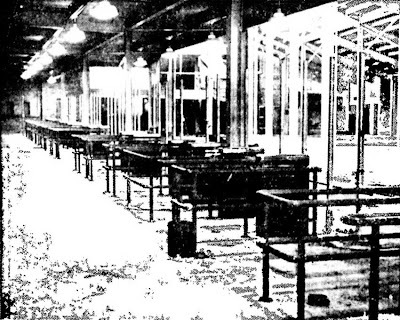 No more waiting in line before a couple of ticket offices as of old. Interesting to get a perspective of the Borchert Field experience, but "fans who remember" the old stadium? It hadn't even been one off-season since the Brewers played their last game. Talk about forward-looking. Everything's big league in Milwaukee's new ball park, including the dugouts. Here is a view of one of the team quarters—a bit more spacious than the old ball park afforded. It's on a par with those in major league parks. This is the first look we have at what the new park was going to offer the players. Note again the emphasis on how ready the new stadium was to host a big-league club. 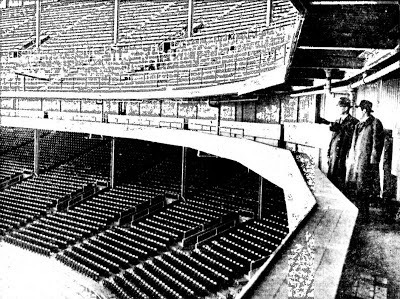 Those long, open dugouts were a far cry from the angled dugouts crammed into Borchert Field's corners. The rush in on. Folks are making certain they'll see the opener. 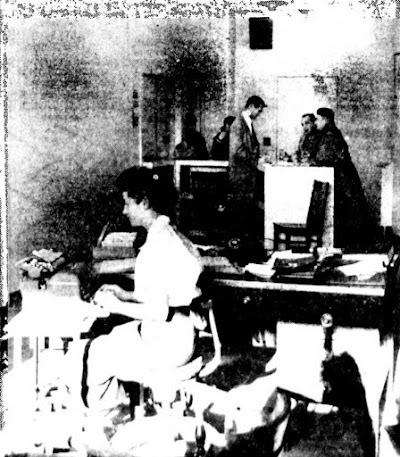 Here is a view of the ball club's office at the stadium as Walter Ludy of South Milwaukee (at right of counter) buys 60 tickets for the big event. Next to him is Jack Schwid, while across the counter is Earl Levy. The girl in foreground is Shirley Mack, 1505 N. Franklin Pl, a secretary. Sixty tickets? A true fan. I've no doubt that Mr. Ludy was first in line to trade those in for Braves' opening day tickets on the day the move was announced. Many of us no doubt remember County Stadium in its later years: a little run-down, in need of a coat of paint. 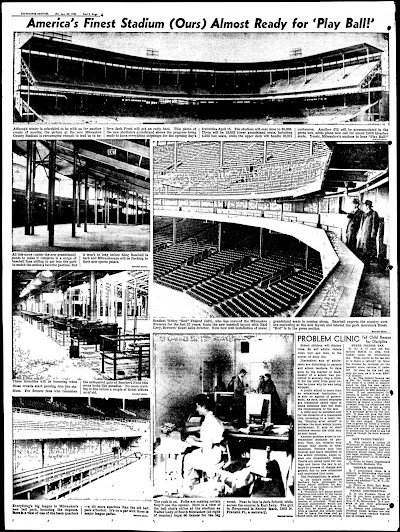 This newspaper page is a reminder of a time when the stadium was new and the Brews' future was wide open. The winning design was submitted by Ben Peters of Richfield, Minnesota. Merchandise is already on sale at Miller Park, no idea if it will ever get online for those of us not lucky enough to live in the Cream City. The caps are gorgeous. 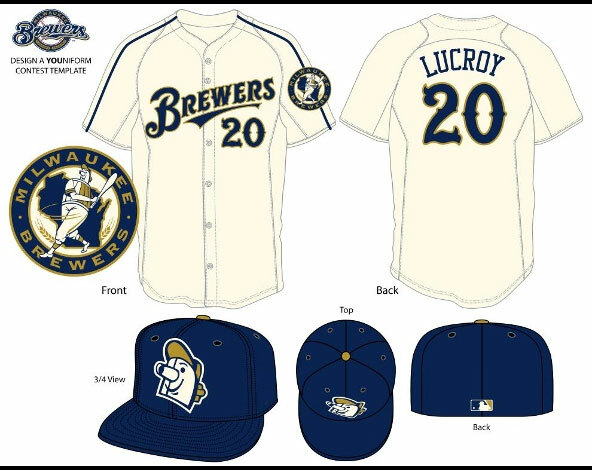 I can't tell if it's just the picture or that's really a deeper shade of blue than the more muted navy the Brewers currently use, but I love it. I'm also, obviously, a huge fan of the logo, even to the point of being willing to set aside my usual disinclination towards mascot caps. There's been renewed interest in the Beer Barrel Man lately, might have to incorporate that into a new article. Contrats to Ben, and this should be interesting to see in Spring Training! 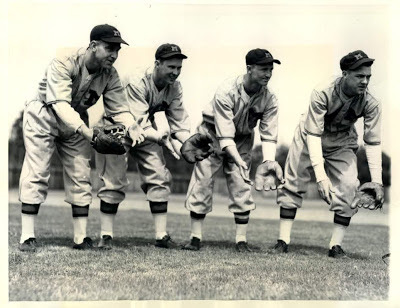 This wire photo introduced newspaper readers to the men who were expected to anchor Borchert Field's infield during the 1937 season. Biloxi, Miss., March 23--Manager Al Sothoron will depend a lot on these hands when the Milwaukee, Wis., team starts their season. He intends to send these men out as the starting infield. Left to right: M.W. 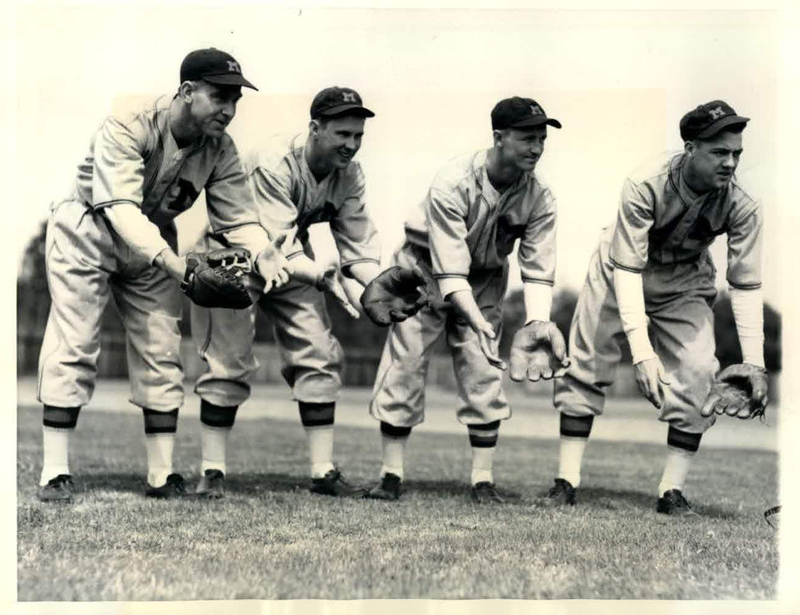 Heath, first base; Ed Hope, second base; Otto Bluege, short stop; and Ken Keltner, third base. Several of these players need no introduction here. Ken Keltner was one of the greatest players ever produced by Milwaukee's sandlots. This was his second season in pro ball, having played one year for the Fieldale (Virginia) Towelers. Keltner made an immediate splash, and didn't even finish the season before being sold to the Cleveland Indians. 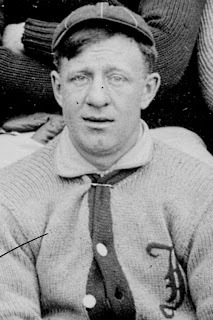 First baseman Minor Wilson "Mickey" Heath was newly-signed away from the Montreal Royals. He had spent part of the previous season playing with the Indianapolis Indians, where he first came to the attention of Brewer management. 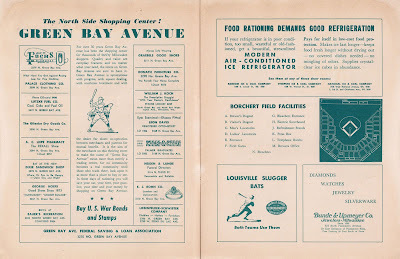 Heath would go on to thrive at Borchert Field, being promoted to player/manager in 1939 upon the firing of Al Sothoron (mentioned in the caption). After his playing career was over he served the Brewers as a coach, executive and longtime radio voice. Eddie Hope was a second baseman, known for sharp fielding but weak hitting. He was about to start his fourth season in a Milwaukee uniform. The man with the shortest tenure in Milwaukee was Otto Bluege. 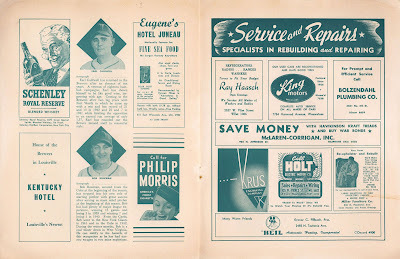 Bluege was a longtime minor-league veteran who had played parts of the 1932 and 1933 seasons with the Cincinnati Reds, and who was purchased from Indianapolis, where he had played with Mickey Heath in 1936. Even before the Brewers broke their Biloxi camp, Bluege was in trouble. His fielding was erratic, and he was benched just one week after this photo hit the wires. 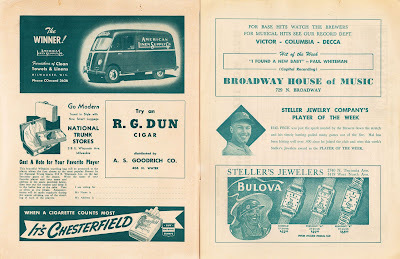 He played sporadically with the Brews until the end of May, when the club sold him to the International League's Jersey City Giants. 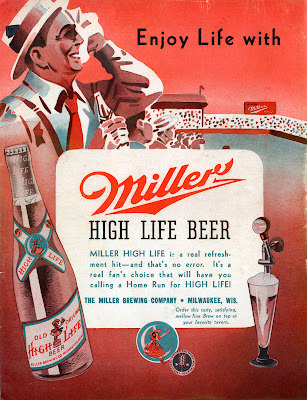 1937 would be a pretty good year for the Brews. Though they fell short of repeating their 1936 American Association pennant, they battled for a very respectable 80-73 record. 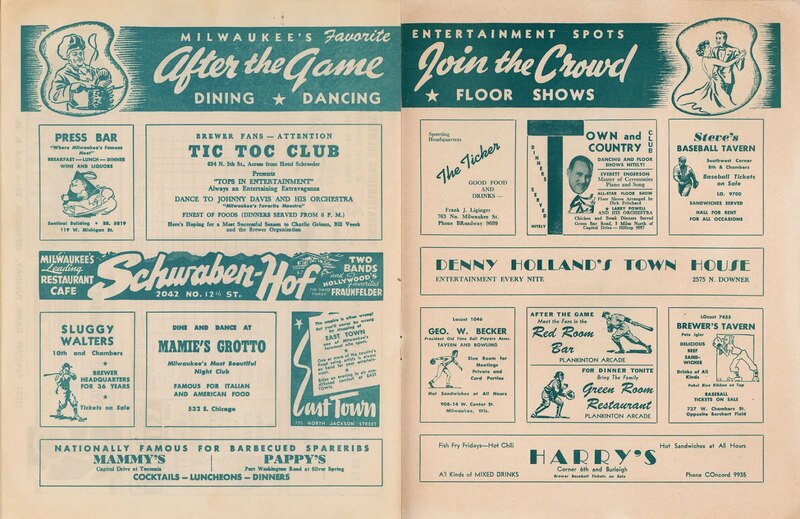 This is Tommy Holmes, in a photo taken from an early 1950s banquet program. He's listed as the manager of the Milwaukee Brewers, but you won't find his name in any of the club's score cards. His road to Milwaukee began with the Boston Braves, the Brewers' parent club since '46, where Holmes originally made his mark. The Brooklyn-born slugger broke into the Braves' lineup in 1942 at the age of 25 and instantly made himself at home. In 1945, he had a monster season at the plate, leading the National League in hits, doubles, home runs and total bases. The fans at Braves Field loved him, especially those who frequented the right field bleachers, known as the "Jury Box." 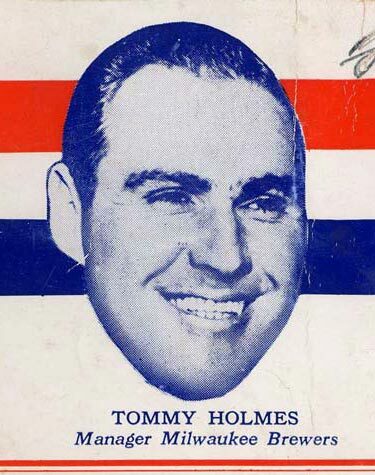 When Holmes retired after the 1950 season, his nine years in a Brave uniform had made him was one of the most popular players in team history. Perhaps in recognition of that popularity, he was immediately given the opportunity to be the player/manager of the club's low-level Eastern League affiliate in Hartford. 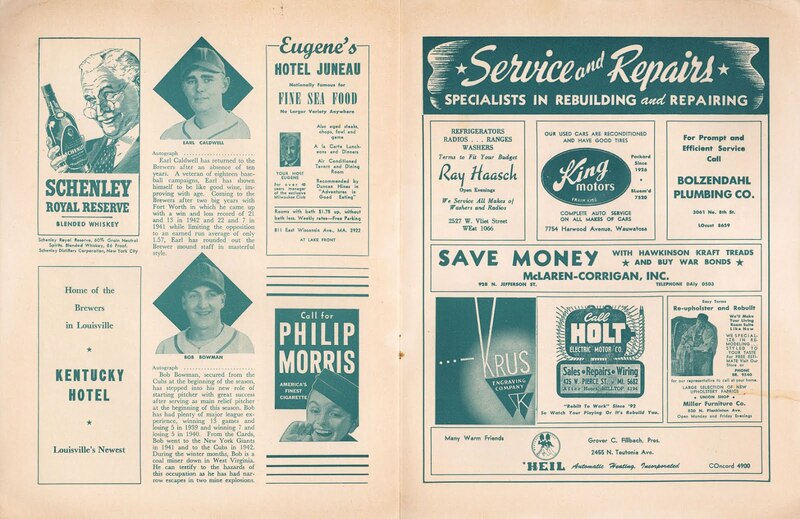 The early returns there were very good, and on June 20, 1951, with less than half a season under his belt, Holmes was called up to manage the big-league team. The Braves had been floundering in mediocrity since winning the National League pennant in '48. The club was stocked with promising young players (many of whom had been developed in Milwaukee), but they failed to produce on the major league stage. The fans were short on patience and so was owner Lou Perini. After consecutive fourth-place finishes in 1949 and 1950 Perini had enough, and skipper Billy Southworth was out, replaced by the fan-favorite Holmes. The new regime was short-lived. The Braves continued to struggle on the field and, even worse, at the gate. Unable to produce the instant results that Perini demanded, Holmes was about to find himself on the receiving end of his employer's mercurial style. Holmes was officially relieved of his duties on May 31, 1952, fired as impulsively as he was hired. The Braves' owner blamed his manager's youth for the club's stuggles, insisting that "we think the world of Tommy, but we now feel he doesn't have enough experience." Holmes reportedly cried when told of the move by long-distance telephone. By the time he talked to the press, he had collected himself. "As a member of the organization, I must follow orders. I will abide by every decision of the Braves officials regarding by future with the organization. "The Braves have always been very patient with me. But I must say the news of my dismissal as manager came as a complete shock." "We have been experimenting with young players and I know that eventually that experiment will bear fruit." Perini was convinced that those young players needed a veteran presence in the clubhouse, and he knew exactly where to find one: the same Milwaukee club so many had come through. The Brewers were led at that time by Charlie Grimm, who was very much enjoying his second stint as master of Borchert Field. He had been a part-owner of the Brewers with Bill Veeck from 1941 through 1945, managing the team himself in 1942 and 43 before moving up to the Chicago Cubs early in the 1944 season. "I never want to return to the majors. I like Milwaukee and it likes me." Perini persisted, reportedly leaning heavily on the skipper's loyalty to the organization, and soon Grimm agreed to leave "his beloved Milwaukee" (and his first-place Brewers) for Boston. 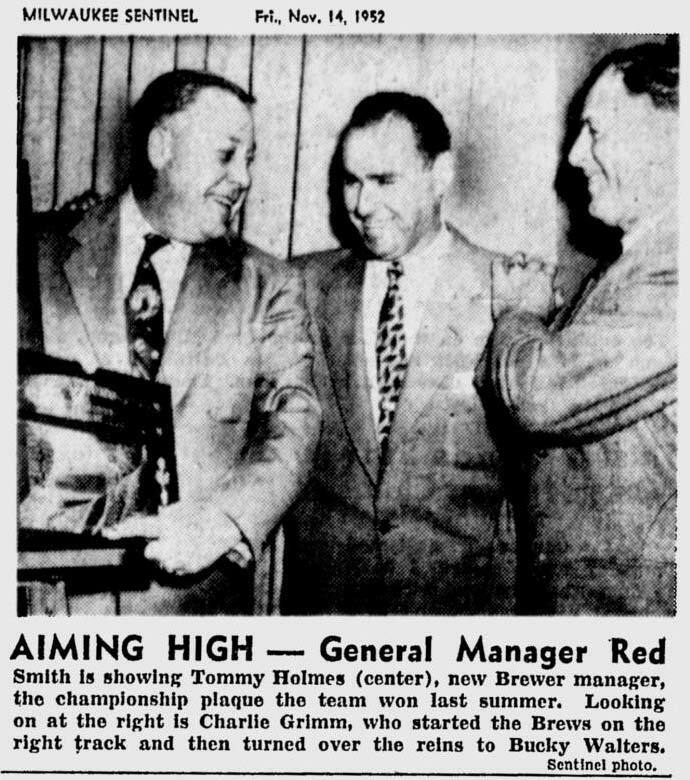 General Manager Red Smith, a former Brewer catcher and longtime coach, put on a Brewer uniform again to serve as interim manager while he searched for Grimm's replacement. One week later, he hired Bucky Walters, the Braves' pitching coach, to finish out the season. "You won't have any worries running this team. This gang loves to win; that's why we're in first place." Smith was right; under their third skipper of the season, the Brewers continued their run. They couldn't keep the top spot to themselves for the entire year, but they were never far out of it. 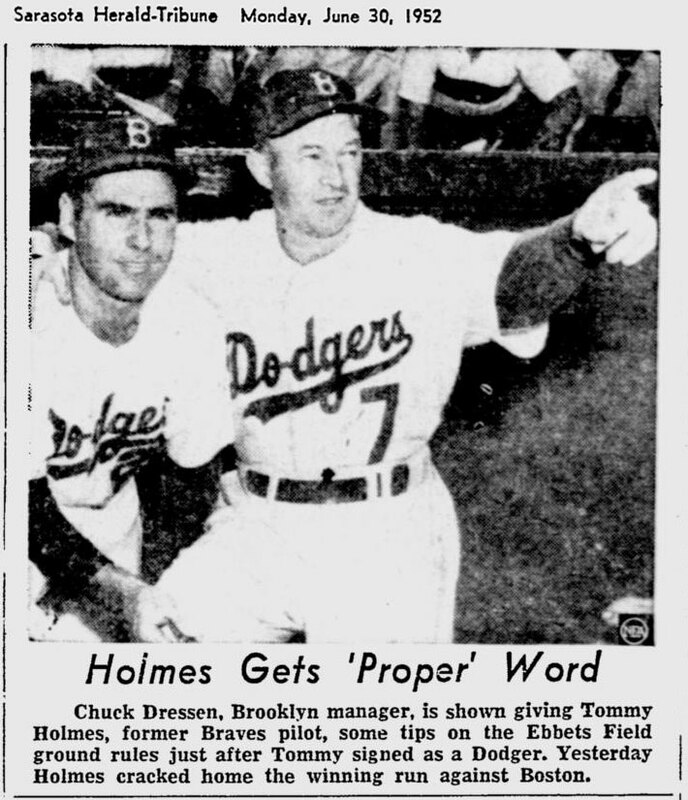 The deposed Holmes spent the remainder of the 1952 season as a pinch-hitter with his hometown Brooklyn Dodgers, planning his return to the managerial ranks. 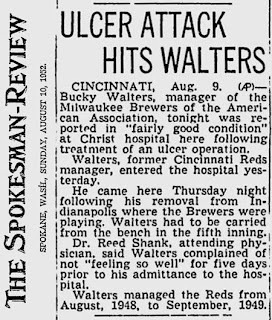 Meanwhile, in the Cream City, Bucky Walters was having a rough go of it. His Brewers were flourishing on the field, but he was stuggling personally. 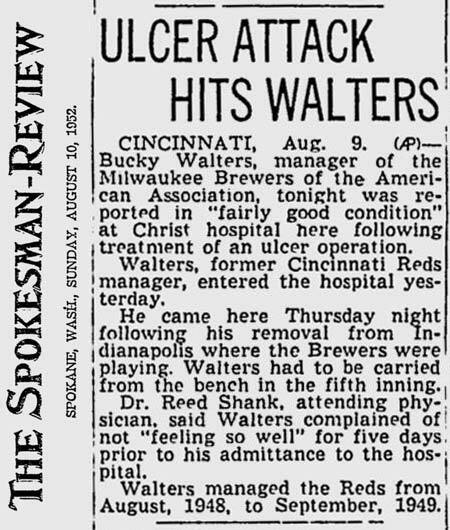 His health was failing and in August, ulcers forced Walters to leave the club during a road trip in Indianapolis for emergency surgery in Cincinnati. He rejoined the club three days later, but continued to be troubled by them. 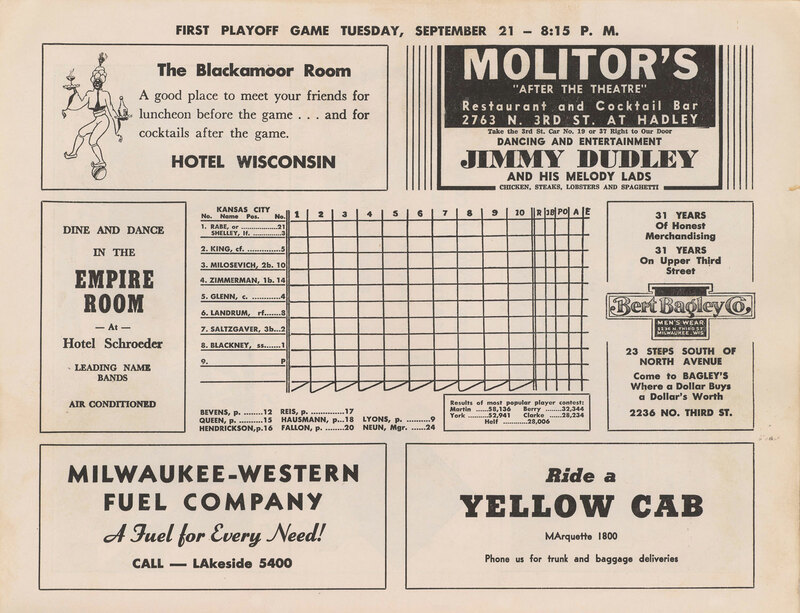 After spending several weeks in August grappling for first place, the Brewers finally pulled away and cruised to a 101-53 record for the 1952 season, giving them a comfortable 12-game lead over the second-place Kansas City Blues and bringing Milwaukee its eighth American Association pennant. 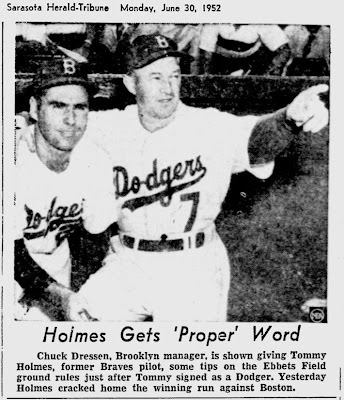 With the 1952 season over, Holmes was determined to take charge of a ballclub again. The Dodgers offered him a chance to return to the Eastern League, this time with the Dodgers' farm team in Elmira, New York. Holmes decided instead to return to the Braves organization, his professional home for so long. Bucky Walters had also come to a decision about his career. 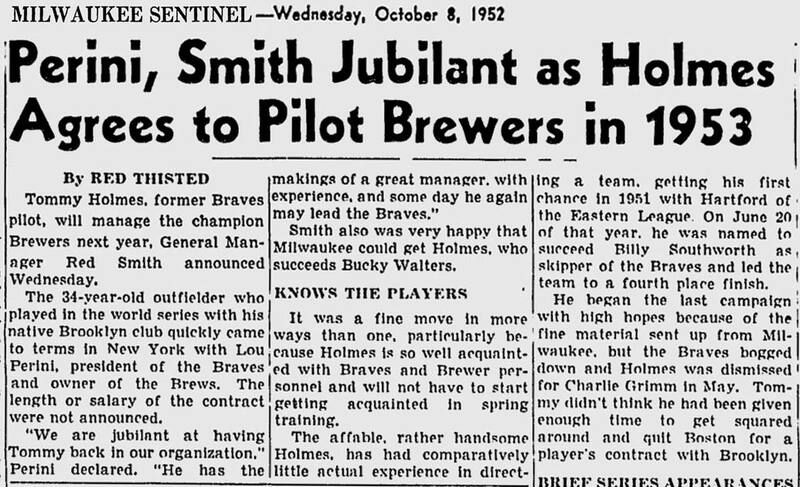 On the advice of his physician, and wishing to be closer to his family in Philadelphia, he told Smith that he would not be back to manage the Brewers in 1953. He would rather coach in the majors than manage in the minors. Perini gave Walters back his old job as the Braves' pitching coach and rewarded Holmes with another managerial gig; this time it wouldn't be buried deep in the farm system but rather at the top rung of the minor league ladder. Tommy Holmes was on his way to Milwaukee, having essentially traded managerial jobs with Charlie Grimm. A month after taking the job, Holmes was in Milwaukee posing for photographs with the 1951 American Association championship plaque and promising to win a third straight pennant. 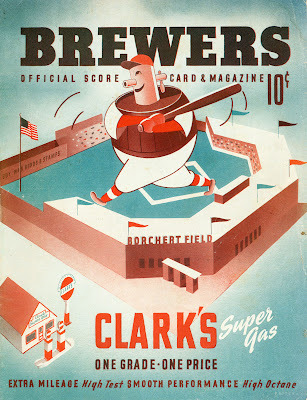 The Brewers' future was looking bright as the calendar turned to 1953; they had a new manager, lots of talent and were all set to move from the cramped, wooden Borchert Field into the brand-new steel-and-concrete Milwaukee County Stadium. As every student of baseball knows, the Brewers' future took a turn before they ever got to make that move. 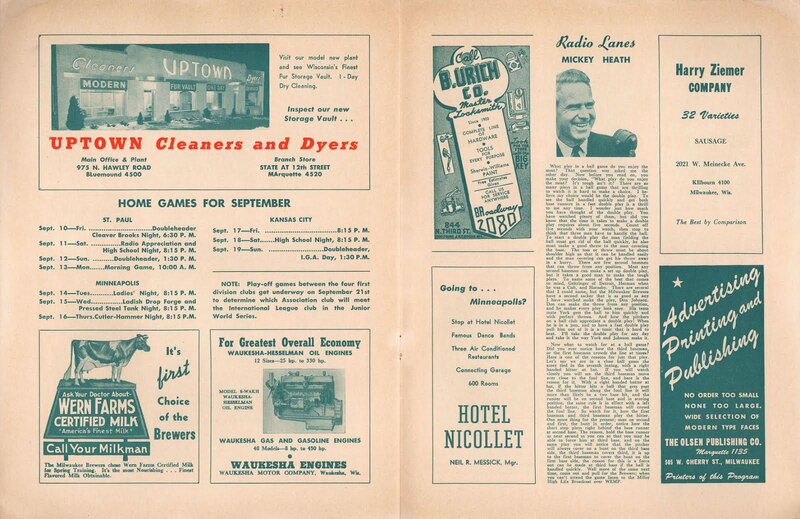 Just days before the season was to start, and after fending off Bill Veeck's attempt to move his St. Louis Browns back to Milwaukee, Louis Perini announced that he was moving the Braves to Milwaukee. Tommy Holmes never got to actually manage a game for the Brewers before he, and the club, was bumped out of town. The suddenly-displaced Brewers ended up in Toledo as the Sox, where they eventually won that third consecutive pennant. Unfortunately for Tommy Holmes, they would have to win it without him. His Sox got off to a sluggish start in their new city, and Holmes was fired twenty-five games into the season. 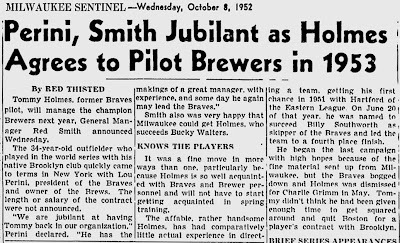 The youth experiment that Holmes had spoken of upon his firing from the Braves job in 1952 did indeed "bear fruit"; five seasons later, those youngsters brought Milwaukee the city's first World Championship. Vote Now in the Brewers' "YOUniform" Contest! 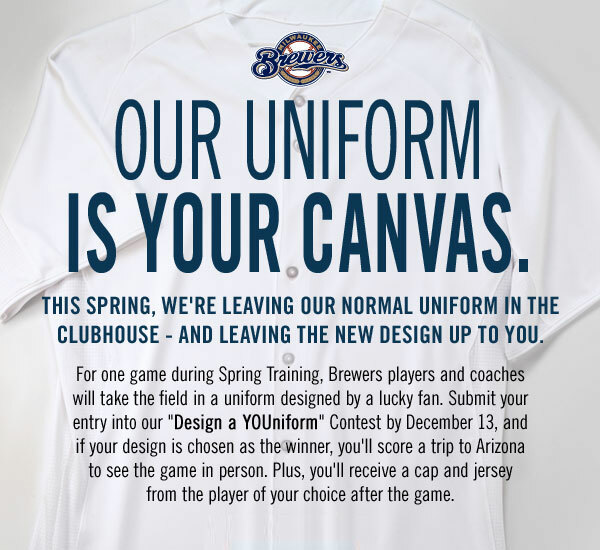 The Brewers have been running a "YOUniform contest", where fans were encouraged to send in submissions for a one-off batting practice jersey and cap. 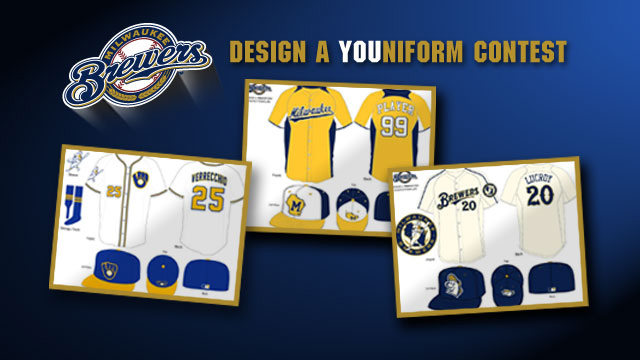 The winning design will be worn in a Spring Training game. The semi-finalists have been announced, and I'm pleased to say that two of the three incorporate the "Beer Barrel Man", Owgust's descendant. Let's look at all three. I have to admit, I'm very much partial to Ben's design. 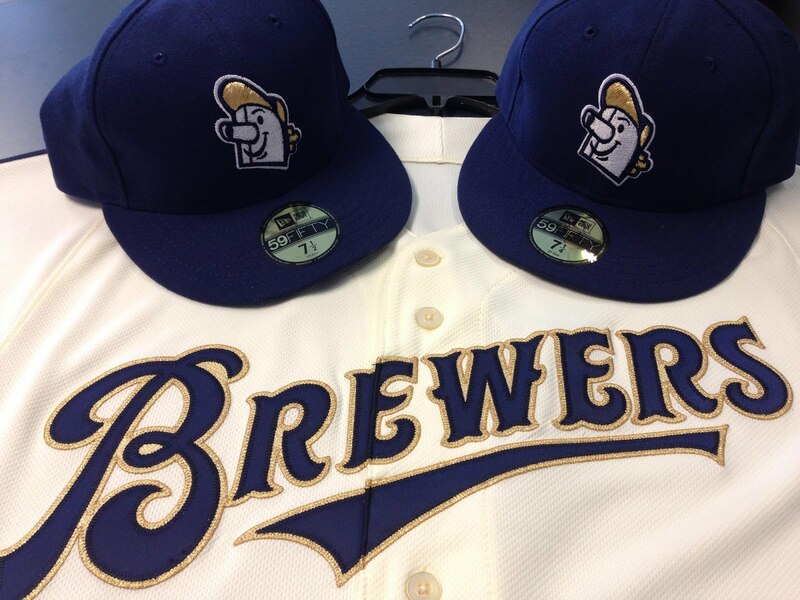 Looks a little like something I worked up for the Brewers not that long ago. And if that's the winning design, I will definitely buy the cap. The fans have been given a vote as one of eight judges (the others to include reliever John Axford and General Manager Doug Melvin). The fan vote is now open, and will remain open until Tuesday, January 22 at 10a.m. Central time. You can vote once per day, so vote early, vote often! Over the last several days, I've been in contact with the curator of the Chudnow Museum of Yesteryear in Milwaukee about an upcoming lecture they're hosting on the Brews in honor of the centennial of the club's first pennant. The lecture will be held on February 18, 2013 at 6pm in the Chudnow Museum Theater. Dr. Patrick Steele, professor of History at Concordia University, will be speaking on the early American Association Milwaukee Brewers. Tickets are $3 for the General Public, $2 with Student ID. The museum is located at 839 North 11th Street in Milwaukee, a little over 2 miles due south of where Borchert Field once stood. I hadn't heard about the Chudnow Museum before this, but it sounds fascinating. I'll definitely check it out on my next visit to Milwaukee, which won't unfortunately be until well after Professor Steele's lecture. If you're able to attend, let me know how it goes. This beautiful Wright & Ditson Napoleon Lajoie-model double-knob bat was featured in MEARS's December auction. Advanced bat collectors will appreciate the link between this store model bat and use in the professional leagues. Born on October 11, 1878 in Chicago, IL, Frank Roth excelled in sports and became a professional baseball player. Mainly a catcher, Frank Roth did play some infield during his major league career which dated from 1903-10. He bounced along the big leagues, playing with the Phillies, Browns, White Sox, and Reds. In between, he played for the Milwaukee Brewers AAA team at Borchert Field during the 1906-08 seasons. This bat was uncovered in Milwaukee, WI as a recent MEARS Auction consignment. It is safe to assume the bat was used during Frank Roth’s career with the Brewers. The provenance comes in the form of his leather bat case, which was engraved, "Frank Roth". The leather is severely deteriorating, but the brass name plate with his name remains intact and in excellent condition. Since great care was taken to protect this bat, it may have been used during Roth’s stint in the major leagues. 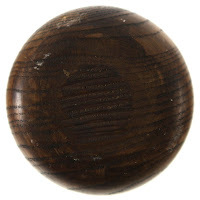 The bat itself is a standard Wright & Ditson Napoleon Lajoie Double Knob bat. Thick handled as was Lajoie’s style, this bat measures 34" and weighs 43 ounces. On one surface in excellent black screening is "Patent Applied For, Wright & Ditson, Boston". On the reverse side "LAJOIE" is deeply factory stamped. Frank Roth, seen here in his rookie-season 1903 Philadelphia Phillies sweater, spent three seasons bouncing around from Philadelphia to the St. Louis Browns to the Chicago White Sox. The Brewers acquired him in 1906 as a platoon catcher, and he produced instantly, hitting .290 in 86 games. At the time, the American Association season was shorter than that of the American League, and after the Brewers closed out their 1906 calendar Roth was sent back to Chicago's South Side by Brewers owner Charles Havenor for the last sixteen games of the big-league schedule. Roth was back in Athletic Park at the beginning of 1907, where he batted .320 before Havenor again loaned Roth to the White Sox in September. 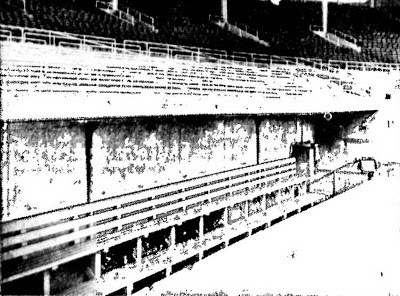 The late-season exposure garnered Roth notice from other big-league clubs, and in February of 1908 the Toledo News-Bee reported that Washington Senators manager Pongo Joe Cantillon (himself a former Brewer skipper) offered to trade his veteran backup catcher Mike Kahoe, 28-year old pitcher Charlie Smith and an unnamed pitcher to Milwaukee for Roth, but Havenor declined. The Cincinnati Reds were more successful in prying Roth away from Athletic Park, and in January of 1909 Havenor announced that he had reached a deal to sell the catcher. Roth played in Cincinnati for two seasons before retiring into the coaching ranks. This gorgeous bat sold for $4,061, including buyers premium. I'd love to talk to the new owner, maybe see if we can get a picture of that leather case. 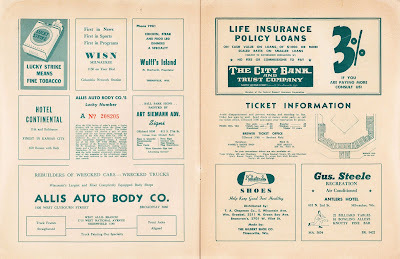 This score card was sold at Borchert Field during the last home stand of the 1943 season. It marks a return to saddle-stitched books after at least a decade of bi-fold cards. On the cover, Owgust stands huge over the Orchard, swinging for the fences. This was his second season as the Brews' mascot, making his cover debut the previous year. 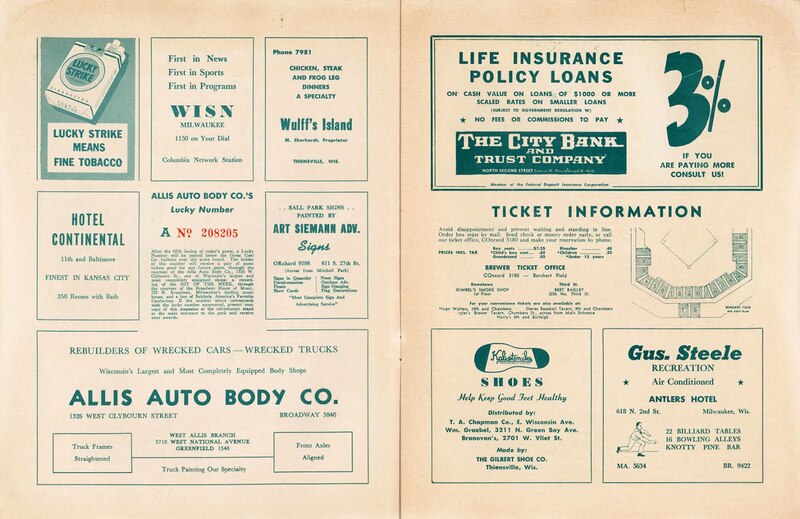 This score card is printed in green and red on newsprint. 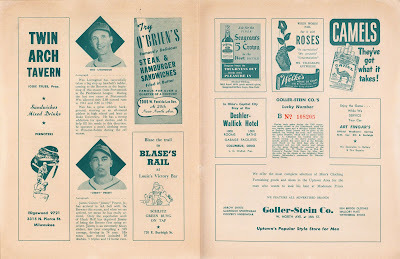 The first pages feature memories of the season from Brewer management (under a banner of Owgusts pitching and catching). The management of the Brewers wish to take this opportunity of thanking the fans of Milwaukee for their loyal support throughout the season. It proved what has always been our contention – that Milwaukee fans are the most loyal in the country. This loyal support has made possible our efforts to supply you with a winning ball club and has renewed our determination to continue to do our utmost to provide you with clean, healthful entertainment whenever you attend the games at Borchert Field. In the following pages, we're introduced to some members of the team. Pitcher "Jittery Joe" Berry (an ironic nickname in the "Little John" mold) was the anchor of the Brewers' rotation. Heinz Becker was the Brews' first baseman. Becker was born in Germany, raised in Dallas and brought to Milwaukee by team president Bill Veeck, where he quickly became a fan favorite. There's a little space under each biography for autographs, but the owner of this copy never collected any. I especially love the Roundy's cartoon in the upper-right corner. Note also the list of Milwaukee Brewers serving in the armed forces. Within a few months, they would be joined by Veeck himself. We also see how the Orchard was laid out in 1943: 395 feet to straight center, 262 down the left field line, 265 down the right, and 424 / 426 to the respective corners. This is very similar to those we've seen before. 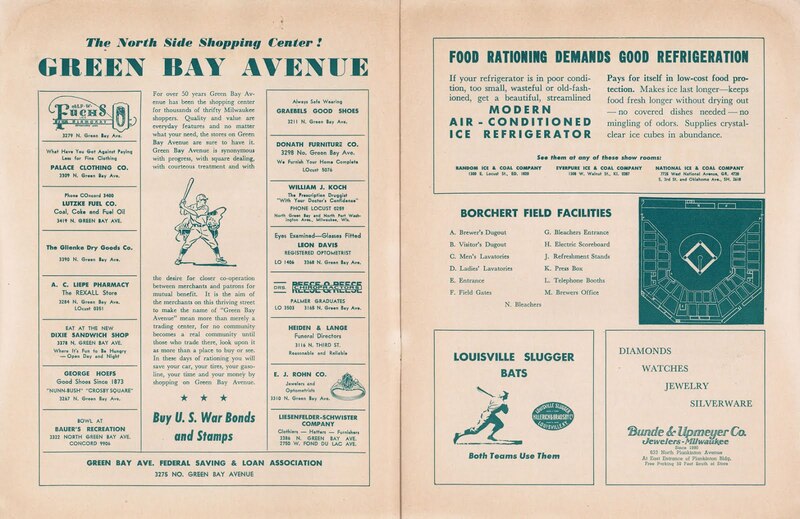 The subsequent pages give us even more information on the ballpark, this time the seating area. 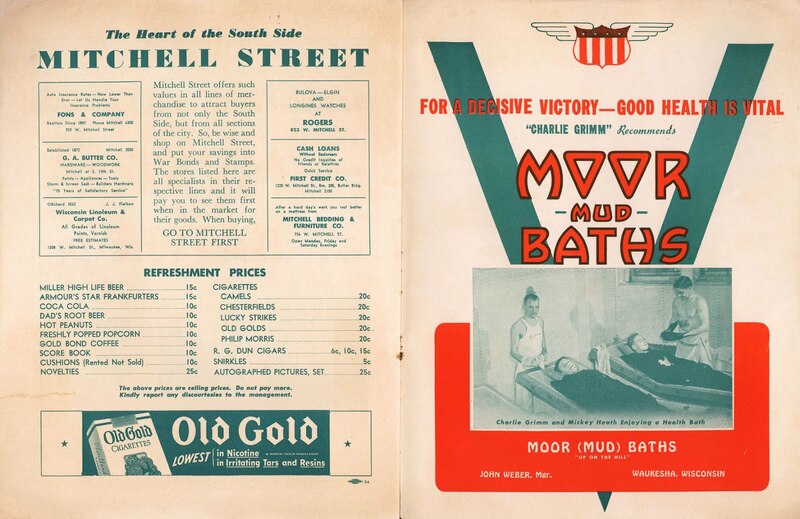 I'm surprised at the number of womens' facilities available in 1943, but maybe I shouldn't be. The Brewers had a long history of female owners, who might have been responsible for accommodating female patrons. Even if they weren't behind it, I'd expect Veeck was. Then there's the "Lucky Number" contest, as constant as anything in the club's history. Hidden in amongst the ads we find the "Steller Jewelry Company's Player of the Week". 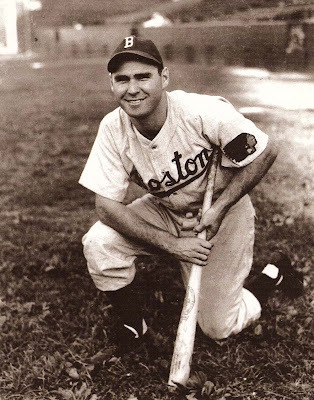 This week it was hard-slugging outfielder Hal Peck, certainly worthy of the award. This takes us to the newsprint score cards in the middle of the book. On this day, the Brews were facing the Kansas City Blues. A cocktail bar in Milwaukee named "Molitor's"? I'll meet you there. On the next page, of course, we have the hometown heroes. Lots of talent in that lineup; 1943 was a very good year for Milwaukee baseball. The next several pages are full of wonderful ads. 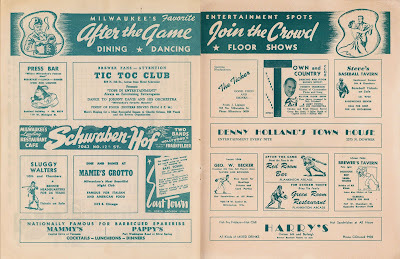 "After the game, join the crowd"! What I wouldn't give to be able to visit some of these spots. The next pages give us much to digest. 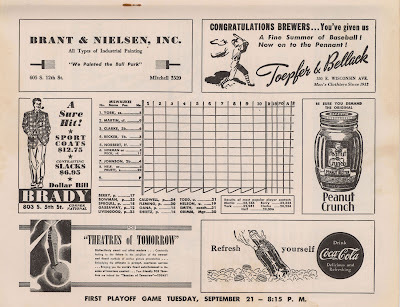 Based on the schedule presented here, we can tell that this score card was sold at the Orchard on either the 17th, 18th or 19th of September (that last one a double-header). 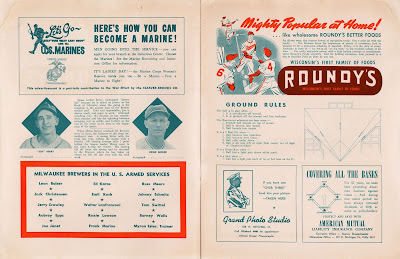 It also indicates that the American Association playoffs would begin just days later, on the 21st, as the four "first division" clubs faced each other to determine who would represent the Association against the International League in the Junior World Series. 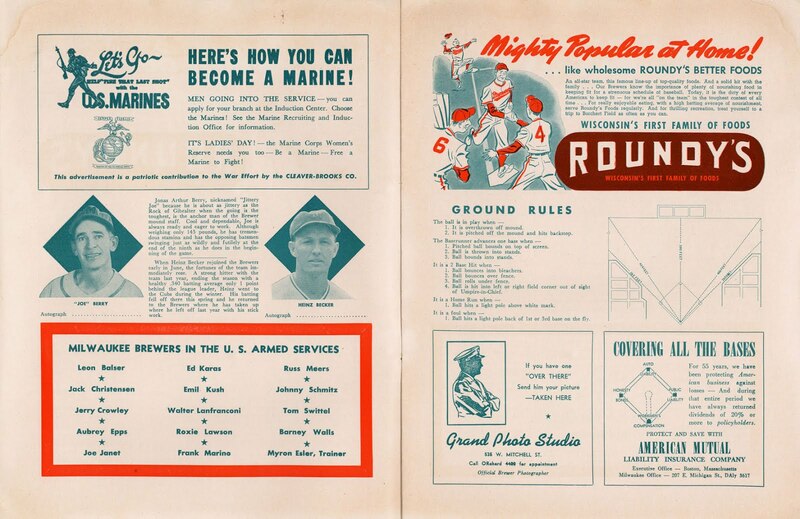 The phrase "first division" has fallen out of use in baseball circles, but in 1943 "first division" and "second division" would have referred to a team's position in the standings; top half was first, bottom half was second. The term fell into disuse when the two Major Leagues expanded and organized their teams into smaller units called "divisions" in 1969. It seems very strange to us today that a team could win their pennant and not move on to the deciding postseason series, but that's exactly what happened in the American Association. 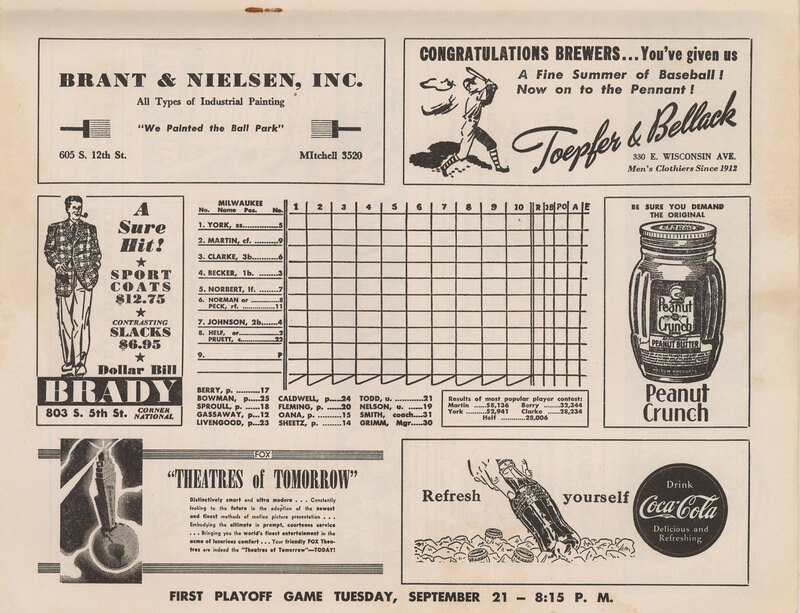 In this particular season, the Brewers finished 90-61, five ½ games ahead of second-place Indianapolis, but were bounced out of the playoffs by the Columbus Red Birds. This was a particular bane of Bill Veeck during his time in Milwaukee, as he was able to assemble clubs that dominated his league during the regular season (winning three pennants in a row) but washed out of the playoffs. We also touch base with Mickey Heath. 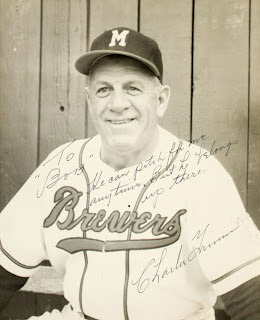 A player/manager for the Brewers in the late 1930s, he moved on to radio and coaching in 1940. 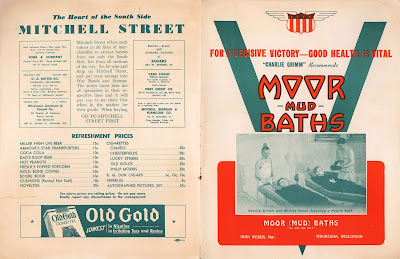 On the inside back cover, Heath and manager Charlie Grimm relax in a mud bath. 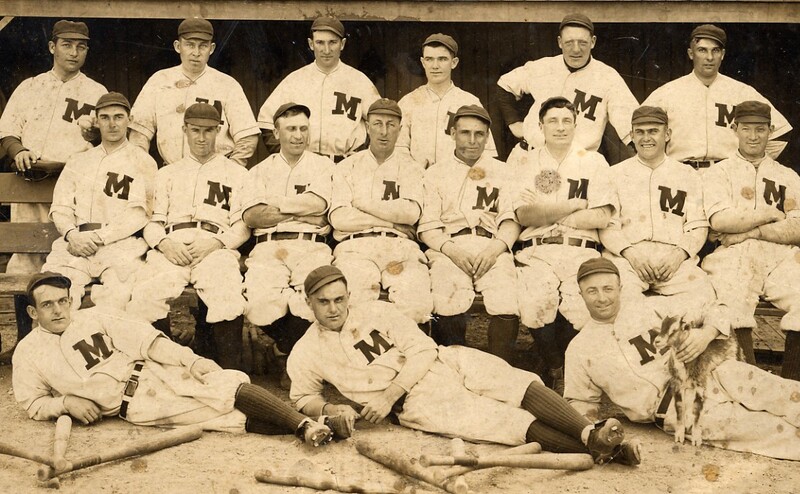 Wartime travel restrictions had forced the Brewers to move Spring Training to Waukesha, but these fellows look like they've made the best of it. 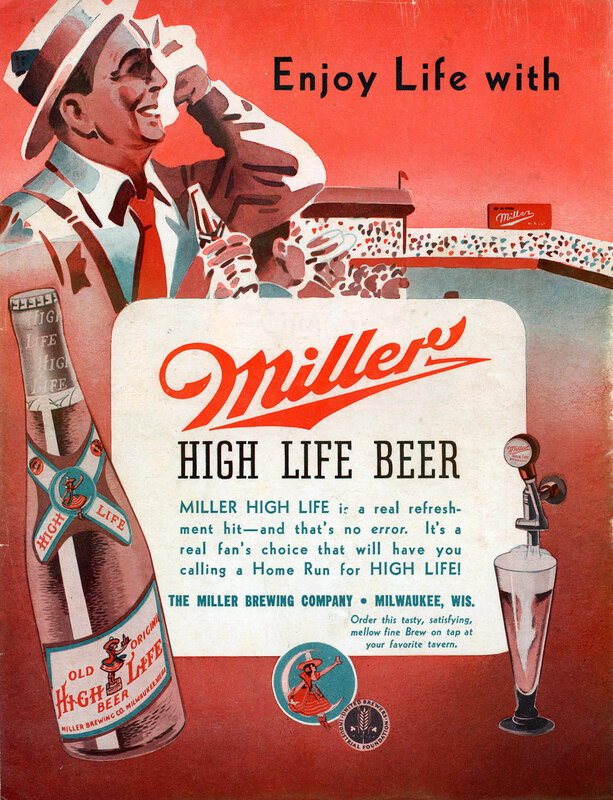 And, of course, we have to finish with a full-page back-cover ad for Miller High Life. What could be more "Milwaukee" than that? 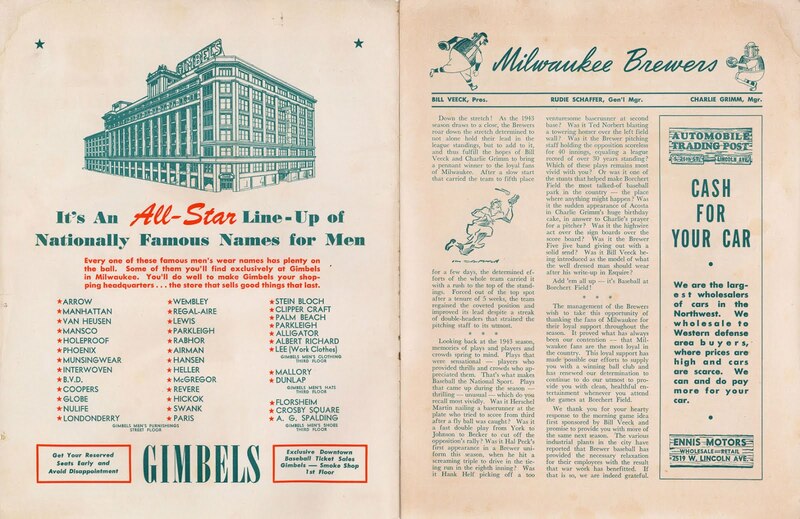 2013 represents the Centennial of the American Association Brewers' first pennant. 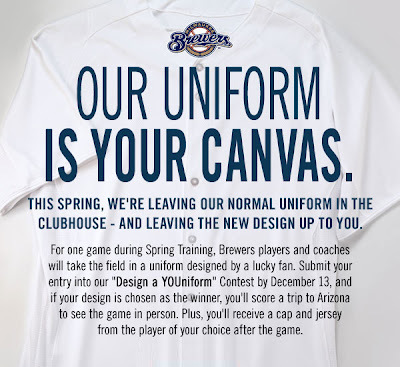 This hasn't gone unnoticed by the big league club; the Brewers are doing something big to celebrate this glorious chapter in Milwaukee baseball history, and I'm honored to have been a small part of it. One thing I can tell you now is that the Brewers will be giving away a bobblehead of first baseman Corey Hart wearing a 1913 throwback uniform! This will be the first official bobblehead honoring our Brews, unless you count the Beer Barrel Man bobble from 2006. 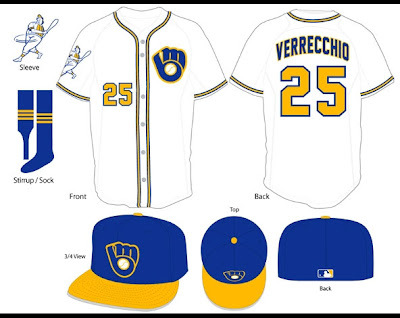 I helped the Brewers with their research on the 1913 uniforms, and was able to send them pictures of an extant jersey from a private collection. I was very encouraged by their insistence that we get it right and be authentic to the originals. Individual tickets for this game won't go on sale until February, but this game is included in 20-Game Sunday Plus Plan now on sale. I'll be there; hope to see you at Miller Park on what will be a great day for fans of Milwaukee's baseball history!